Commute-A-Walk To The Rescue Again In Chicago ORD! - Welcome to EAST ISLAND AVIATION SERVICES, Inc. In early 2018 United Airlines needed a short term solution to protect and connect passengers to a new aircraft parking spot on the F-concourse. Gate F22B was designed and developed for immediate aircraft operations but unfortunately there was no Jet Bridge. 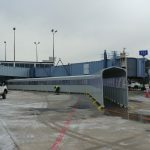 Rossi Contractors immediately reached out to East Island Aviation to come up with a modular ground tunnel that could fit between two existing Jet Bridges. 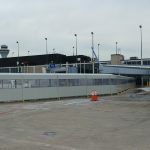 The passenger corridor needed to not only protect passengers but needed to meet the stringent criteria set forth by the Chicago Dept of Aviation (CDA). Our “FX” modules were the perfect solution. In less than 45 days East Island Aviation and Rossi got United up and running for full passenger activity. 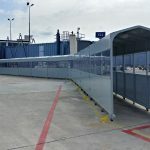 United has already found a new location to re-use the walkway once a Jet Bridge is installed, and the modular design makes it a snap to un-pin and relocate to another gate or even a different airport with minimal GSE or Facilities support. 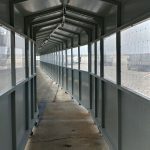 Since 1996 East Island’s modular FX walkway tunnels and patented retractable articulating Commute-A-Walk® have been protecting and directing passengers across the tarmac around the globe. For more information on Commute-A-Walk or any of our other ground boarding equipment, feel free to contact us. This entry was posted in News on August 27, 2018 by Jim Larson.